I realize my saying “iLuv MobiOut”, it sounds like I am saying I love MobiOut. In this case, it is quite true. I definitely like to review iLuv products, like the Aud5. This MobiOut looks like the Braven 570 that we reviewed last week, and it has very similar features. 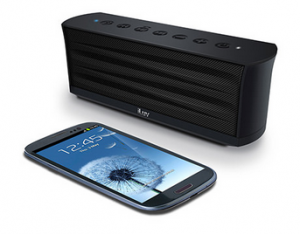 It is a Bluetooth speaker with controls on top, but an added bonus is Jump-Start technology, which means you can use it to charge mobile device. Wait, the Braven 570 does that too. I am guessing that the biggest difference is that it is splash-proof. It has a lot of bass, and I don’t want to say that one Bluetooth speaker is better than another. So let us end with a spec, it has a 9 hour battery life. If you are interested in this, you can get it on the iLuv site for about $119.99.